In act I, scene 1 of The Misanthrope, Alceste, the misanthrope, claims that court is filled with people who praise a person, but find fault with the same person the moment he or she leaves. He is angry with his friend Philinte who has been courteous with a person he barely knows. Were he Philinte, he would hang himself. Go to, you ought to die for very shame! Arouse abhorrence in all men of honour. You hardly can remember even his name! And you inform me you care nothing for him! I should go straight and hang myself for spite. Ironically, Alceste is in love with Célimène who enjoys depicting the ills of others. She does so to entertain those who admire her. Célimène is a charming twenty-year-old widow seeking attention and pleasure. In seventeenth-century France, young, and not-so-young, widows were privileged. They could choose to marry or not to marry, and, if they chose to marry, they married a person whom they loved, not a spouse imposed on them by a greedy father. Her portrait of Alceste is that of a man who is very contrary. Must not the gentleman needs contradict? The spirit of gainsaying he’s endowed with? If he were caught agreeing with anyone. If he but hears them from another’s lips. Given his view of society, a world where everyone speaks ill of others, Alceste’s love for Célimène, is incongruous. Destiny has been unkind to him. However, although he is contrary, he does not criticize Célimène in the portrait scene (2.iv). He turns to her admirers and blames them. You must address your censures to the lady. That hitherto I’ve found the lady faultless. But as for faults, I haven’t seen them yet. That’s saying everything. On with your satire! And lovers always like to vaunt their choice. For in the loved one, all seems lovable. Appears a goddess to adoring eyes. The silent girl, so modest and retiring. Love even the faults of her whom he admires. Que vous avez voulu me ramener chez moi ? Et mon cœur, de cela, ne peut s’accommoder. That you were kind enough to bring me home? Besieging you—a thing I can’t endure. Alceste is jealous. Yet, Éliante’s tirade is about all lovers, including Alceste. Aime, jusqu’aux défauts des personnes qu’il aime. And do as much for any scamp he meets? You might as well love none, as everybody. Le Misanthrope is a problematic play. Célimène would marry Alceste, but she would not follow him into a desert, a refuge in seventeenth-century France. She is too young. Et dans votre désert aller m’ensevelir ! And go be buried in your solitude! Yet, the curtain falls on a marriage. Éliante will marry Philinte. Both follow Alceste, so everyone leaves the stage. The curtain falls and nobody is laughing. True to Célimène’s portrait of him, Alceste has taken up arms against himself. Alceste who loves Célimène, who loves him, refuses to marry her. Moreover, although Alceste is rigid, he shares Philinte’s views, but he will not be tolerant and calm. He will be angry (bile). Let no word pass unless it’s from the heart. Mon flegme est philosophe, autant que votre bile. As good philosophy as is your choler. Structurally, Alceste, as a character, combines several comedic functions. He is the heavy father (the alazôn of Greek comedy) who opposes the marriage of young lovers. But he is also the innamorati of the commedia dell’arte and Atellane farce, not to mention the young lover of Greek Old Comedy (Aristophanes). Finally, he is the eirôn, a role he shares with Philinte. He is all three stock characters of farces. However, Molière’s Misanthrope is not a farce. Or is it? The Misanthrope is une grande comédie (five acts, alexandrine verses [12 syllables], the court). The play also contains “mirrors.” Arsinoé, the prude, is Célimène as she could be at an older age. Paul Bénichou, Morales du Grand Siècle (Paris : Gallimard, 1948), pp. 295-296. Micheline Bourbeau-Walker, LE MISANTHROPE, ou la comédie éclatée, in David Trott & Nicole Boursier, eds. L’Âge du Théâtre en France/The Age of Theater is France (Edmonton: Academic Printing and Publishing, 1988), pp. 53-61. There are indications I will not live eternally, but I have an unfinished project: publishing a book on Molière. This goal may be unrealistic. However, I will not be given another chance. It will be a short book and I may not have reviewed recent literature on the subject as thoroughly as I would like to. Yet, I wrote a PhD thesis on Molière, and a PhD thesis is a scholarly venture. Moreover, I was expected to “dust it off,” a thesis is a thesis, and publish it. Dusting it off is what I plan to do. In other words, it will not sound too scholarly. I will quote fellow moliéristes, but will focus on my findings. Were it not for the intervention of a second father, the young couples in L’Avare (The Miser), 1668, could not marry. They would be at the mercy of Harpagon’s greed. Matters are worse in Tartuffe, 1664 -1669. Were it not for the intervention of the king, not only would the young lovers not marry, but Orgon’s family would be ruined. In The Misanthrope,1666, Alceste is his own worst enemy. In Dom Juan, 1665, Dom Juan is removed by a deus ex machina and he has left Elvira, his wife. Chapters may resemble Molière’s “L’Avare:” Doublings, a post. This post is informative, but not too scholarly. It also illustrates my main finding. In Molière’s plays, the young lovers cannot marry without an intervention, or putting on a play (Le Bourgeois gentilhomme). In L’Avare, they are saved by a second father: doublings. Molière uses stage devices, such as a deus ex machina, to save the society of the play. Therefore, if a blocking character is removed, he is a pharmakos (a scapegoat). L’Avare, 1668, (The Miser) is rooted in Roman playwright Plautus‘ Aulularia. Plautus died in 184 BCE. Molière’s miserly father is a Shylock (The Merchant of Venice, c. 1600, by Shakespeare). There are misers in the commedia dell’arte, and Molière knew the stock characters of the commedia dell’arte. Comedy has a tradition. Greek playwright Aristophanes is considered its father. Molière also wrote farces. These date back not only to medieval France, but to the Atellane farces, which featured stock characters, as does the commedia dell’arte. I feel very young, but time goes by so quickly. It would please me to tell more about Molière, but it has to be now. It’s my last chance and there you are, supporting me. I wish to thank a very kind gentleman who sent me images of Colette‘s La Chatte by Raoul Dufy. Je vous remercie bien sincèrement d’avoir pensé à moi. Ces dessins de Dufy me font plaisir. Votre générosité m’a beaucoup touchée. Colette a eu une « dernière chatte », et j’ai, pour ma part, une dernière occasion. I have not been able to write due to various house chores. I haven’t quite finished settling down. In the past, I settled into a home in a matter of days. This time, I will have to hire professionals. How humbling! You may remember that I lost my voice on 11 December. It has now returned, but it is different. X-rays revealed advanced emphysema. I could not believe my doctor. Two thirds of my lungs have turned into a dry sponge. I have never smoked. I can breathe ‘normally,’ so no treatment is necessary. However, I am losing my driver’s license: myalgic encephalomyelitis, not emphysema, although the two could be linked. I had a long career as a driver. I bought an apartment located close to a little market. Just in case… The little market has everything I need. I have been told I qualified for a service dog, but Belaud said no. My cat Belaud was delighted when I discovered a painting featuring a chartreux sitting on a lady’s lap: artistic roots. French poet Joachim du Bellay had a chartreux named Belaud. When his Belaud died, he wrote an extroardinary epitaph entitled Sur la mort de Belaud. As you know, I share my home and life with a cat named Belaud. Belaud is a pure-bred French chartreux. I named my chartreux after Joachim du Bellay‘s Belaud. Du Bellay’s Sur la mort de Belaud is a long poem I would not attempt to translate. Belaud has literary roots, but the J. Paul Getty Museum has a painting featuring a dignified lady, nose up, holding her precious chartreux. Artist Jean-Baptiste Perronneau (French, 1715 – 1783) is not as prominent a figure as Joachim du Bellay, but we owe him the portrait of a chartreux, and images are immediate. Upon analysis, we may find that a picture is complex, but in the case of Perronneau’s portrait, we know we are seeing a lady, Magdaleine Pinceloup de la Grange, holding her beloved cat, a chartreux. Because of this portrait, chartreux have acquired greater stature. A cat protrayed is a thousand cats. Moreover, Jean-Baptiste Perronneau depicted a chartreux sitting in the lap of the distinguished madame Pinceloup de la Grange. I told Belaud that a portrait of a chartreux had surfaced. “Well, mother,” said Belaud, “I knew. We cats research our ancestry.” Mme Pinceloup de la Grange’s chartreux could indeed be Belaud’s ancestor. However, my Belaud does not wear a collar because he is not a threat to birds. He would love to be hired to chase away various rats, “gros rats.” In fact, one gentleman offered him a lucrative contract: “toxicity” said the gentleman, “toxicity! It will be the Black Death all over again.” The gentleman died a few weeks later. Given their profession, chasing rats, chartreux are large and very robust cats. Fearing the cold, they wear two coats of fur. I should also mention that they enjoy sitting with their legs extended forward and that they sometimes cross their legs, as though they were dogs, or human beings. They may be referred to as blue cats, but they are grey cats. The light, however, may make their fur appear blue and even mauve. 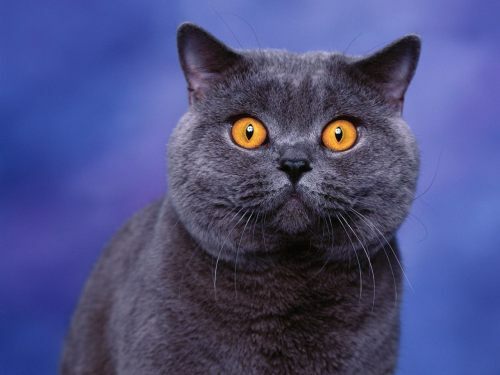 The chartreux and their British Blue relatives have a round face, large cheeks, a permanent smile and yellow to copper eyes. I should also tell you that Chartreux are very quiet. Legend has it that their silent owners, Carthusian monks, taught them silence. Belaud purrs, but he is otherwise absolutely silent. A long time ago, I read they were brought to France by crusaders. Were Carthusians crusaders? Du Bellay’s epitaph on Belaud is very long, but very rich. Besides, Du Bellay is a better-known figure than monsieur Perronneau. He was a member of La Pléiade, a group of stellar poets who are the fountainhead of poetry in French. Poet Pierre de Ronsard (11 September 1524 – 27 December 1585) was a prince of poets, un prince des poètes, which is not insignificant, but he is famous for a carpe diem poem. In one of his Sonnets pour Hélène, he enjoins Hélène to love him dès aujourd’hui, as of today, life being so short. There was an Hélène whose gentleman friend had died in a war. She was not in the least interested in Ronsard, but Ronsard’s poem is unforgettable. As for Du Bellay’s poetry, it is eminently quotable. Heureux qui, comme Ulysse, a fait un beau voyage is perfection, but Du Bellay’s place and fame in literature rest mainly on his Défense et illustration de la langue française, 1549, considered the Pléiade’s manifesto. The Renaissance was a moment of effervescence. Greek scholars and artists had fled the Byzantine Empire when Constantinople fell to the Ottoman Empire under Mehmed the Conqueror, on 30 May 1453. Hence, Du Bellay’s reference to Ulysses /Odysseus. Italy was the first refuge of Greek scholars. As for painters, Christians, they fled to Russia, carrying icons. Constantinople had been a Holy See for Eastern Christianity. We know about the Great East/West Schism, 1054. The Vatican is Western Christianity’s Holy See. The Eastern Church would have several Holy Sees, called Synods. The arrival in Italy of Greek scholars may have led scholars to look to Antiquity and learn Greek. The Renaissance, however, saw the emergence of the vernacular, the mother tongue. Du Bellay promoted the vernacular, French in his case. He was inspired by Italian author Sperone Speroni’s Dialogo delle lingue, 1542. Speroni was a friend and supporter of Venetian-language playwright Angelo Beolco (el Ruzante). However, the greater supporter of the vernacular was Pietro Bembo (20 May 1470 – either 11 January or 18 January). Bembo championed the use of Italian by poet Petrarch (20 July 1304 – 18/19 July 1374). Predecessors were Dante Alighieri (c. 1265 – 1321), the author of the Divine Comedy, written in the vernacular, and Giovanni Boccaccio (16 June 1313 – 21 December 1375), the author of the Decameron, written in the Florentine language. Chartreux are often compared to British blue cats. There is a resemblance, but the two breeds differ. The snout of British Blues does not point forward as much as the snout of chartreux. Consequently, British Blues have rounder faces and larger jowls. Belaud’s face is round, but his jowls are not as prominent as the jowls of his British cousins. I was able to gather precious information about Chartreux and British Blues. My very bilingual Scottish friend, Francis, was hired to go between English-speaking Winston Churchill and Charles De Gaulle, who spoke French, as D-Day was planned. How did Francis survive being a go-between to such men? De Gaulle would not always agree with Churchill and he communicated with the Free French Forces, Forces françaises libres which he led beginning on 28 June 1940. L’appel du 18 juin (1940), a radio broadcast, the BBC, gave hope to the French. France had defenders: the United States and the British Empire. Churchill was at times livid, said Francis, discreetly. We have learned since that De Gaulle told the Forces françaises libres that Paul Verlaine’s Chanson d’automne would be used in the planning of D-Day. Verlaine is un prince des poètes, but Chanson d’automne was a code. Obviously, sharing the code was dangerous, but I wonder whether Francis had a role to play in the Querelle des Chartreux et des Bleus britanniques. He would not have told me. But truth me told, a querelle des chats took place in the thick of a devastating war. The British wanted to mix the Chartreux with the British Blue and De Gaulle would not allow the national cat of France simply to vanish. Later, Yvonne, De Gaulle’s wife, gave her husband a chartreux which le général called Gris [grey]-Gris. Gris-Gris probably had an aristocratic name, but le général called him Gris-Gris. Gris-Gris followed De Gaulle from room to room. Writers Sidonie-Gabrielle Colette, and Charles Baudelaire also adopted a chartreux. Belaud’s mother was a Sidonie de… I cannot remember the rest of her name, but his father was Tennessee. The cat she called la dernière chatte (the last cat), was no doubt a chartreux. This post is a shameful coq-à-l’âne (jumping from one subject to another). The coq-à-l’âne had a terrible reputation, but now that marginalia is all the rage, I’m saved. However, I will close proudly as Belaud is all over this post, un fil conducteur, a link, carrying weight.